We use some pretty serious photo tuning tools on the iPad to get the effects we are looking for. Not all photos have to be for work though, there are fun apps for the family to play with on the iPad2. 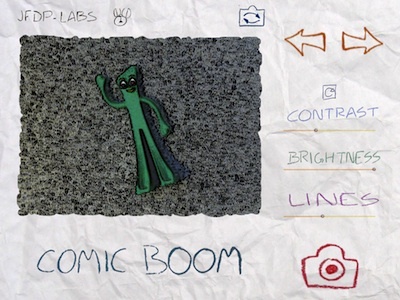 Enter ‘Paper Camera‘, a Universal app that has a creative fun UI for taking pictures. In the same way that Hipstamatic app works, Paper Camera takes the image with the filter applied, it is not an app to edit a image from the iPad’s Photo Library. This makes the actual taking of the picture an adventure since what you shoot is what you get. It has proven to be fun for the kids in our households that are old enough to be playing with our iPads. The folks around the office have been creating some unique fun pictures too. 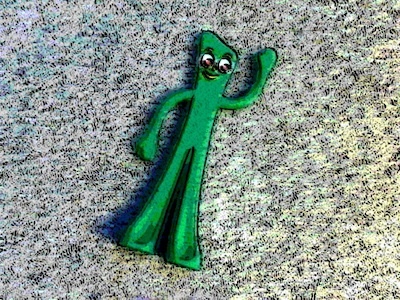 Yes, Gumby is in our office. 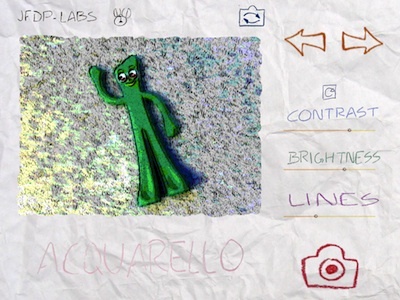 Like we said, Paper Camera has made the actual taking of the picture a different direction with their paper and handwriting look. The text, with the exception of the developer’s logo in the upper left corner, are the controls. At the top is a camera like image with two arrows, this flips the camera from rear to front facing. The left/right arrows cycle through the different ‘lens’ filters. The image in the middle of the page shows exactly what the photo taken will be while just under is the name of the filter being used. There are currently 8 filters (Comic Boom, Sketch Up, Acquarello, Old Printer, Neon Cola, Con Tours, Bleaching and Gotham Noir. Three more filters are coming (in Apple approval at the time of this writing). On the right of the page is sliders to adjust the Contrast, Brightness and Lines with a ‘reset to default’ button at the top of the list. Sliding the adjusters will change the image on the left in real time. When you have the Paper Camera image to your liking, tap the red camera icon in the lower right corner to snap the photo to your iPad’s Photo Library. Of course, this app only works on the iPad2 that actually has a camera (and iPhone/Touch).